The Jesuit Father Milley is one of the few ecclesiastics of the Marseilles plague apart from Monseigneur de Belsunce, who is more than a name to us. He features prominently on the memorial column erected in 1802 as "commissaire of the rue de l'Escale, principal foyer of contagion"
is depicted in the background with the painter Michel Serre. Claude François Milley was born on 20th January 1668 in Montigny-les-Charlieu in Franche-Comté and attended the Jesuit College of the Trinity in Lyons. He entered the Society of Jesus in September 1685 at the age of seventeen and was ordained a priest in 1696. Having completed his novitiate in Avignon, he made his final profession as a Jesuit in February 1702. Milley obviously demonstrated talent both as a preacher and administrator for in the early part of his career he was placed in charge of the Jesuit "mission des Cévennes", preaching among the Protestants of Provence. Having resided in Alès, Apt and Aix-en-Province, he finally settled in Marseilles in 1710, where he consolidated his reputation as a spiritual director and was closely associated with Bishop Belsunce in the promotion of the cult of the Sacred Heart. 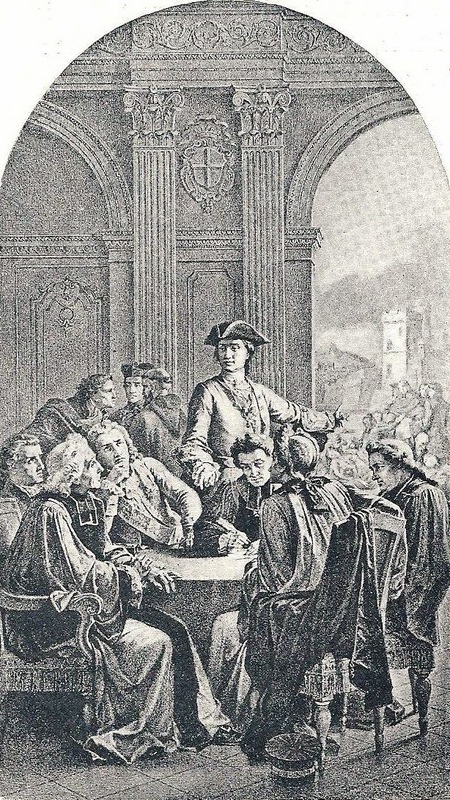 When plague struck, Milley asked to be put officially in charge of the rue de l'Escale (rue de l'Échelle) one of the most impoverished and cruelly affected area of the city. For several weeks, he could be seen among the houses of the sick, bringing not only spiritual consolation but practical help. With the assistance of two saintly women, the Jourdain sisters, he distributed broth to the hungry, and did not fear himself to eat with the plague victims. He often accompanied Belsunce on his missions to distribute the sacraments and unfailingly sought to rally his fellow clergy. On 23rd August he held confession for more than an hour surrounded by piles of dead bodies, and was even seen to lose his footing among them. He was finally laid low by the odour and by exhaustion and contracted the plague himself. He was taken ill on the 27th August. On the 28th he was still strong enough to write on 28th to the Bishop apologising because he was no longer being able to accompany him. He received the last rites on 30th and died an edifying death on 2nd September, still exhorting his fellow Jesuits to have courage. His loss was bitterly regretted by Belsunce who wrote to the Archbishop of Arles, Forbin-Janson,informing him of the death of "poor P.Millay, whose zeal was without parallel." Nowadays, however, Father Milley is better remembered not for his conduct during the plague, but as a spiritual teacher and prominent adherent of the mystic tradition of "abandonment to Divine Love". Pope Francis, himself a Jesuit, has recently mentioned the tradition of Jesuit mystics, Milley among them, from whom he takes inspiration. Likewise the Dictionnaire de spiritualité identifies Milley as an important figure in the "courant mystique" which flourished in Provence in semi-clandestine fashion following the papal condemnation of Fénelon's Maximes of the saints in 1699. Milley himself pursued his goals mainly in his capacity as spiritual director to members of the religious orders. Like Fénelon with Mme de Guyon, he formed a close spiritual relationship with a female mystic, Madeleine-Joseph de Siry, a superior of the Visitandines, whom he first encountered during his time in Apt in 1707. He was also associated with the prominent laywoman Therèse de Galliffet in Aix, and with the mystic pastor Joseph Arnaud from Le Tholonet. Above all he was spiritual director to Madeleine-Anne Rémuzat,the Marseilles visionary of the Sacred Heart. Although he published nothing in his lifetime, his correspondance with a number of Ursuline and Vistandine nuns was edited by Jean Brémond in 1942. Some commentators have seen a direct relationship between Malley’s spiritual position and his conduct during the plague. In a 1995 book the French historian Georges Minois characterised self-abandonment as a "substitute for suicide" and strongly implied that Milley had a death wish. [See Minois, History of suicide: voluntary death in Western culture, p.205; extract on Google Books] This is a dubious piece of pop-psychology. There is a world of difference between mystic self-annihilation and a miserable death from bubonic plague! Although sometimes criticised for their lack of precaution, there is no evidence that any of the Marseilles clergy deliberately courted martyrdom. The most we can say is that Milley's understanding of mystic experience reinforced his absolute trust in divine Providence. Abandonment to divine Will entailed liberation from "anxious self-examination" but it still entailed obligation to the discipline of vocation, that is the monastic routine of communal life and prayer, or, for lay priests, their professional tasks. 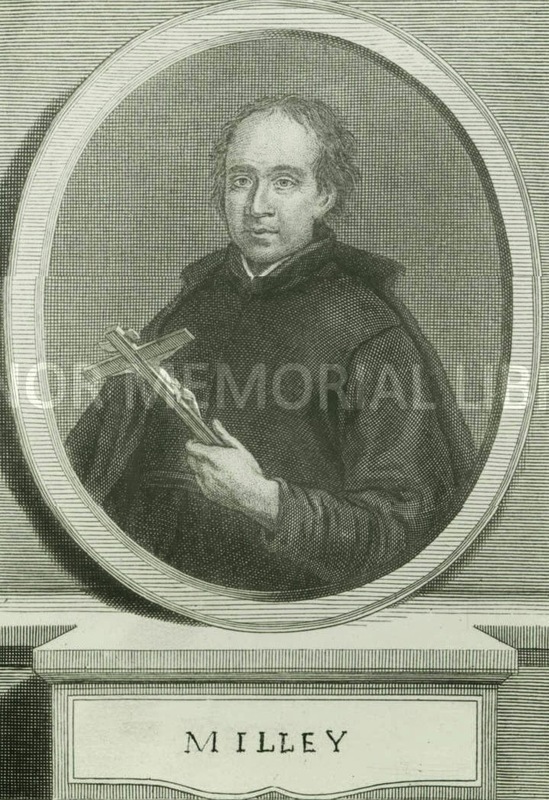 Milley was a strong personality and capable organiser who fully espoused the Jesuit active mission, and sought, until his own life was cut short, to provide practical and spiritual succour to the victims of plague. Marseilles, 1720: the arrival of a plague ship.